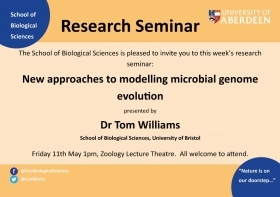 Dr Tom Williams for the University of Bristol joins the list of speakers for the SBS Friday research seminar series. Interested in cell evolution research, Tom obtained a B.A. in Genetics (2007) and a Ph.D. in molecular evolution (2010) from Trinity College Dublin. His Ph.D. work with Mario Fares focused on the evolution of molecular chaperones in Bacteria and Archaea, and on the effect of chaperone-mediated buffering of destabilising mutations on protein evolutionary rates. 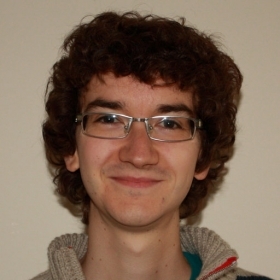 From 2010-2015, he was a Marie Curie Fellow and then a Research Associate in Martin Embley's group at Newcastle University, working on phylogenomics and eukaryotic genome evolution. In 2015, Tom joined Bristol as a Royal Society University Research Fellow, first in Earth Sciences and now in the School of Biological Sciences.